I have tried several semiya recipes like tomato sevai, semiya upma, lemon sevai etc. This recipe is made using coconut milk so will have coconut flavor. This dish came out well. We had it for tiffin. The soya chunk and coconut milk combination have worked out well. Believe me, you cannot have enough of it. Soya Chunks – 10 Nos. 1. Fry semiya in Ghee. Now, put the semiya in hot water for 2 minutes, and then put it in cold water. Squeeze out the water, and keep the semiya aside. 2. Grind the ingredients under the To Grind Section using very little water. 3. In a pan, heat oil. Fry chillies and onion. When onions turn golden brown, add soya chunks, ground paste, mint and coriander leaves. Fry for 2 minutes. 4. Now, add tomatoes, vegetables, turmeric powder, and salt. Saute till vegetable are boiled well. Finally, add coconut milk and 1 cup water. Boil well. 5. When the water starts boiling, add semiya. Close the pan using a lid and boil the soya semiya delight in sim fire for 10 minutes. Now, Soya Semiya Delight is ready!!! Note. I do not know who owns this recipe. If anyone owns it, do let me know. I always give credit to the owner of the recipe if it is not mine. Thank you! 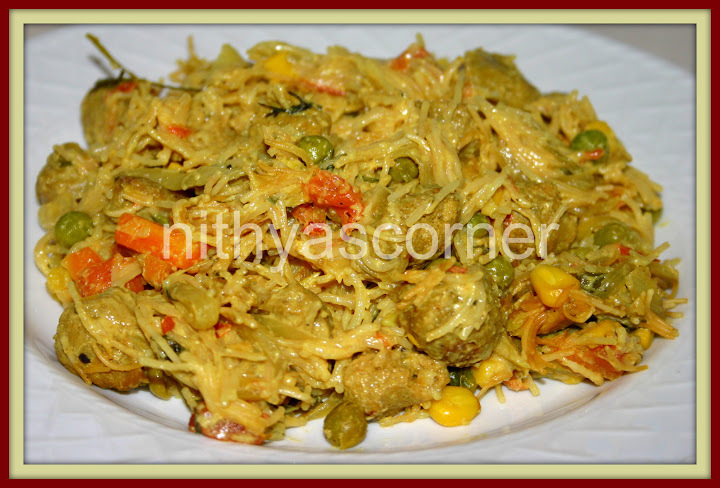 This entry was posted in Vermicelli/Semiya and tagged coconut milk, Recipe, Semiya Delight, Soya Chunks on November 22, 2014 by vikashbhardwaz.